At the Sake Experience at HYPER JAPAN, you may have dropped by the Sake Shop where lots of delicious brands of sake and liquers were available to purchase. Umeshu (梅酒) plum wine is always a favourite and it’s no surprise that sales are strong even among those who don’t always like sake. With the constant need to innovate and stand out in a crowded field of products and competitors, umeshu makers are turning to novel corners for inspiration. Enter Chiisana Shiawase (ちいさなしあわせ) “lit: small happiness“, a collaborative effort between Asahara Shuzo (麻原酒造) and former AKB48 idol Sumire Sato! 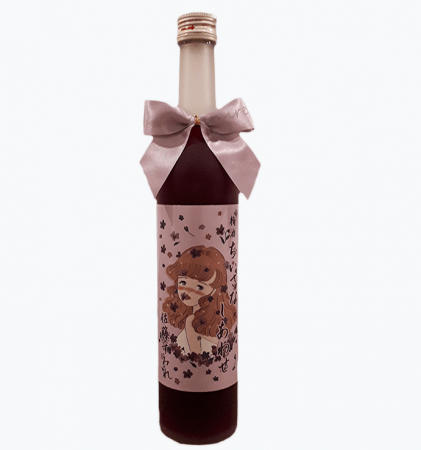 The product blends a Cabernet Sauvignon with umeshu liquer made from Ogose plums. Chiisana Shiawase goes on sale today so check it out here!